Kilkenny Castle in south-east Ireland is a 12th century castle once owned by the Butler family, one of the most powerful dynasties in Ireland. It is now one of the most popular visitor attractions in the region. The Belleek Christmas plate features Kilkenny Castle and measures 9" diameter. The fine china Irish plate is handmade in Belleek, Ireland and it is received gift boxed complements of The Irish Gift House. 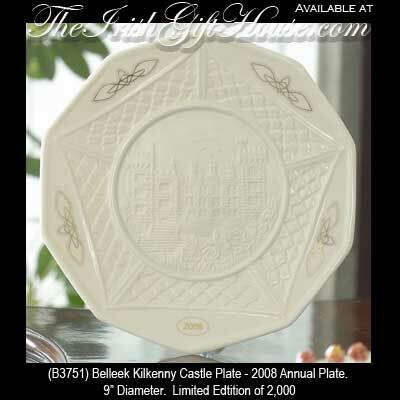 The Belleek Kilkenny Castle Christmas plate for 2008 is a limited production of 2,000 pieces and it is individually numbered with a special backstamp.